A Dole Whip A Day: Great Tip for Saving Money on your Disney Vacation! Great Tip for Saving Money on your Disney Vacation! If you know me, you know that two of my favorite things are Disney and Target! Today I was able to combine my faves to save me money on my upcoming Disneyland vacation! You get 5% off of ANY purchase at Target with a Red Card, including gift cards!! Before going to the store, I looked at how much Disneyland tickets were going to cost me. I need 3 day passes, and this time I'm trying 1 park per day to save a little $$. For 2 adults and 1 child (my youngest is still under 3 and doesn't need a ticket - woohoo! ), my total would be $694. 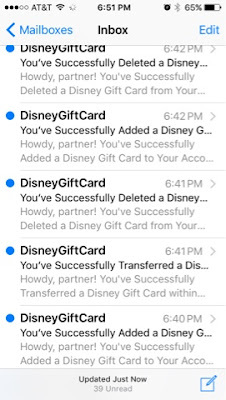 So I need $700 in Disney gift cards. Here's the slightly annoying part; Target only sells $50 Disney gift cards. I guess it's better than $25s! So I had to buy 14 gift cards... the cashier was very confused, but was pretty excited to hear my plan. After my 5% discount, I saved $35! I'll take it!!! I went to www.disneygiftcard.com to register my cards. Here's where the patience was needed. 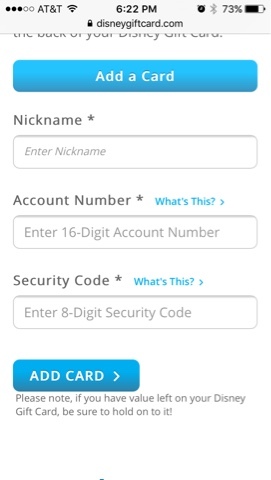 I had to register each card by typing in the account number and security code. You can only have 5 cards registered at a time, so after I input each card, I immediately transferred the balance onto the first card I entered, and deleted the empty one. The transferring and deleting was incredibly simple. It was just a time consuming process with 14 cards! Then all I had to do was buy my tickets online with the one gift card that held the entire $700 balance. NOTE #1: The Disneyland app doesn't seem to let you pay with gift cards. Use the website instead if you don't want to buy at the ticket booths when you get there. 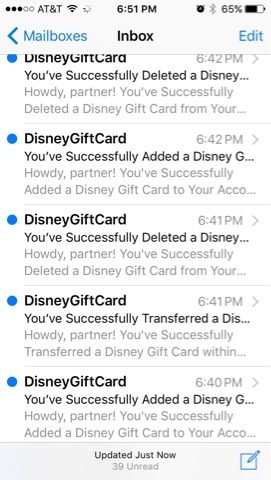 NOTE #2: Just so you know, you'll get an email from the gift card website each time you add a card, transfer a card balance, or delete a card. I finished all of that work only to find 39 unread emails in my inbox to sort through! Next time I'd plan ahead! 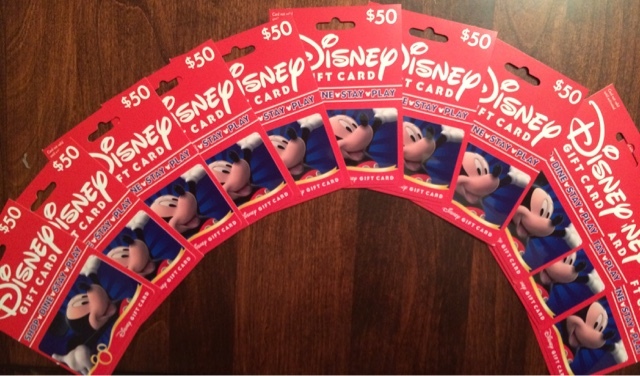 I could pick up a Disney gift card every time I'm at Target and pay for my whole next trip this way. 5% isn't bad on an entire Disney vacation! Also, doing it more slowly would save me the irritation of trying to input, transfer, and delete ONE MILLION gift cards all while my dinner is cooking. I still may do it! I have a couple days to make another Target run. I could buy a few more gift cards to get 5% off my meals and souvenirs. Now pay your Target Red card balance with a Visa or AMEX card that gives you 3% rewards and you save another $19.95. Nice!!! My Target card is debit, so that doesn't work for me, but it's a great tip!! !